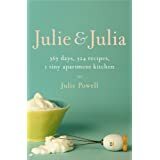 I picked up a copy of Julie and Julia about a year ago because it had this subtitle: 365 days, 524 recipes and 1 tiny apartment kitchen (the subtitle changed in later editions). And it was about a woman have a bit of a life crisis. In Queens. It was like it was made for me. And let me tell you, Powell's memoir is well worth the read, whatever your motivations. She is quick, witty and poignant, scattering her adventures in the kitchen-and in life-with enough life lessons to keep one's mind turning. Not to worry, however: her self-deprication and humor, combined with her refusal to wallow for too long in self pity, keeps it from turning into her own personal sob story. This is not a me-me-me memoir, as so many are wont to be. Instead, it is an honest, laugh-out-loud (dear, instant messaging has ruined that turn of phrase, hasn't it? ), touching and thought-provoking account of one woman's realization that her life is in shambles -- and her (relatively successful) attempt to change that. What Powell has created in this process is an imagination of Julia Child - and it turns out to be just that, an imagination - and a lot of buttery French food. What she learns in the process is that life is what you make of it. And what she made of it was 524 recipes, a popular blog, and a great book. Bottom line: Prepare to laugh, cry, and suddenly find yourself craving bone marrow and lobster at odd times of the night. Powell's writing is as delicious as one would imagine her food to be. Oh, it's been on my list too. Problem is, where's the time? I would love to see the movie, but I feel I need to read the book first, which , if you saw my book list, you'd know the movie will be out on DVD long before I find the opportunity to turn the pages! Too many book, too little time! BTW, I love this post -- keep up the good work! I too wish to see the movie, but do I have to read the book first? I mean, some say that reading the book first ruins the movie, since so many things change when going from book to movie. Not to say I don't believe your better judgment when you tell me to read then watch, but I really think it depends on the person reading. So, as your little sister I ask you: Should I read then watch, or watch then read?